Storms, storms, storms. We are finally paying the price for such wonderfully warm weather. Fortunately, monsoon rain is exactly what I need as I crank out my dissertation. I will admit, however, that storms always provoke a longing to curl up with one of the Harry Potter books. Nothing says rainy day reading quite like a bit of JK Rowling. Until 22 August, these longings will have to remain unfulfilled. But, never fear. I’m still finding time in my study/work breaks to get a fair bit of reading done. 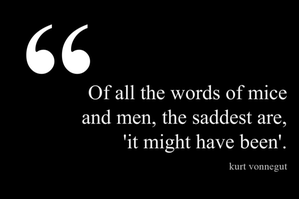 In honour of my current read, Slaughterhouse 5, today’s Monday Musing comes courtesy of Kurt Vonnegut. Next ›Happy (early) Birthday JK Rowling!